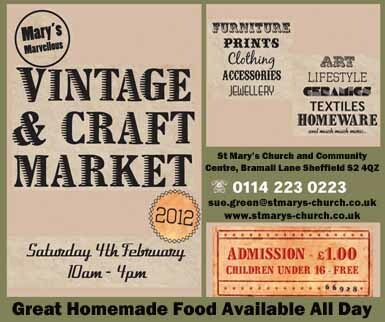 St Mary’s Vintage and Craft Market | IT'S HAPPENING IN HEELEY! Recycling your money to make a difference to people’s lives! St Mary’s Vintage and Craft Market, on Saturday 4th February, brings together dozens of traders specialising in 20s, 30s, 40s, 50s and 60s design alongside talented local artists. The day will be brought to life with a new retro soundtrack playing throughout the day! Stall holders and artists please contact: sue.green@stmarys-church.co.uk or telephone 07729 833 081 for more information and availibility of stalls.